Live Stand Up Comedy At the Grand Banker — Andrew Vaughan, Comedian. 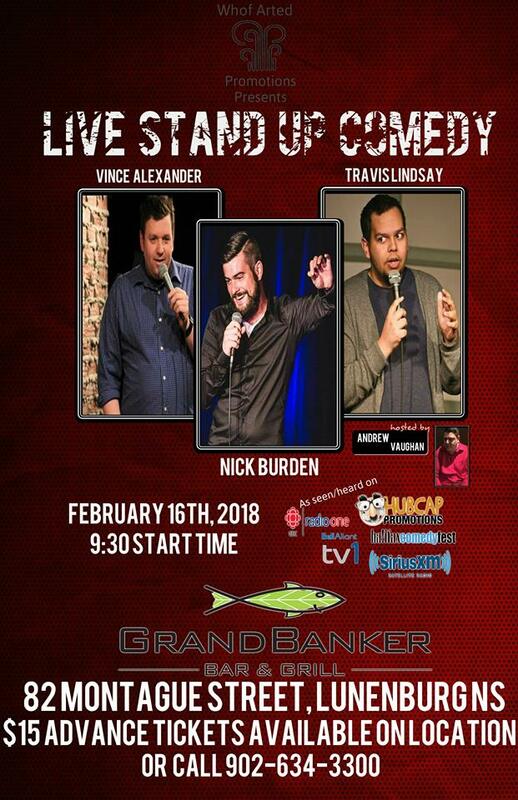 Live stand up comedy returns to The Grand Banker with four comics including 2 east coast crowd favorites and 2 comics touring comics from Ontario! On location or by calling 902-634-3300. Returning to Lunenburg is crowd favorite Andrew Vaughan! He’ll be hosting the show this time around and bringing you 3 amazing acts! Travis Lindsay is the most prolific writer in East Coast Comedy. His great mix of jokes and storytelling has been captivating audiences since the early age of 16. Travis was named 2016 “Best Nova Scotia Comedian” on James Mullinger’s Comedy Boot Camp, is a 3 time runner up on Sirius XM’s next top comic, and has appeared multiple times on Sirius XM satellite radio. In 2018 Travis will make his television debut as he tapes for the CBC and the Halifax Comedy Festival. Originally starting his comedy Career in New Brunswick, Vince moved to Thunder Bay Ontario where he quickly rose to the top of the comedy scene there and became a staple at the “Crickets Comedy Club”. Vince’s sharp wit mixed with the roots from his home in Cape Breton have been entertaining audiences all over the country and is someone to keep your eye on. Nick Burden started comedy in late 2013 from a bet and has been touring across North America ever since. His small town demeanor and ability to take on any topic he chooses is all part of his charm and makes him a favorite wherever he performs. He was the 2014 winner of the "Prove you’re a comic" contest at absolute comedy and in 2018 will be performing at the Hubcap and Timmins comedy festivals.